Hey now. We've never done anything to get blamed for, other than doing nothing. I've got my eyes on you, Quack188. Hey now. We've never done anything to get blamed for, other than doing nothing, while we're burning down the White House. Last edited by Xn F M; May 20th, 2011 at 01:42 AM. Reason: fixed the grammar in the fix, though I think there should be a semicolon in there somewhere . . . . Realized I should probably post a link to this here-The Soldiers of Valhalla is looking for a new judge! CCG Armory allowed me to add 200 to my cart. Auggies has said that he can continue to order them. The cost of the figure ranges from 3-4 dollars. The ability Rabble Rouser allows you to regather the Goblin cutters after they have been demolished or sacrificed. At 25 points I would probably take four. Here is a link to the pre submission for Auggies website. In theory I really like the interaction between the Brutes and the Cutters, in practice, not so much. I'm not sure how much the HSC will improve that (OM on him as opposed to the Cutters: move 5 figs, attack with 1, versus move 4 figs, attack with 4), but I'd like to give him a chance. I vote YES to review the Horned Skull Champion by qt.bangarang. Yes to reviewing qt. bangerang's Horned Skull Champion. It'll be interesting to see how he works & if his price is correct. Tyrian the Kyrie Warrior by Paronychodon is a well-balanced and well-priced custom that serves solidly as an end-game clean-up unit. Unfortunately, through the couple dozen games I played him his utilitarian role failed to spark with me. He has an excellent base move, but with his humble range of 5 he rarely gets to take full advantage of it and can often easily be engaged. His relatively short range also makes it nearly impossible to keep him out of range of enemy units, and his 4/2 life/defense combo doesn't keep him alive very long, even when he can gain height. Tyrian's specific combination of powers isn't seen on any official unit, but he feels very similiar to Syvarris and Atlaga, except he lacks their trade-mark ability to help him stand out. I had the best luck with him when I kept him back until the end of the game, then dashed him out to take advantage of his double attack to assassinate my opponent's last few units. 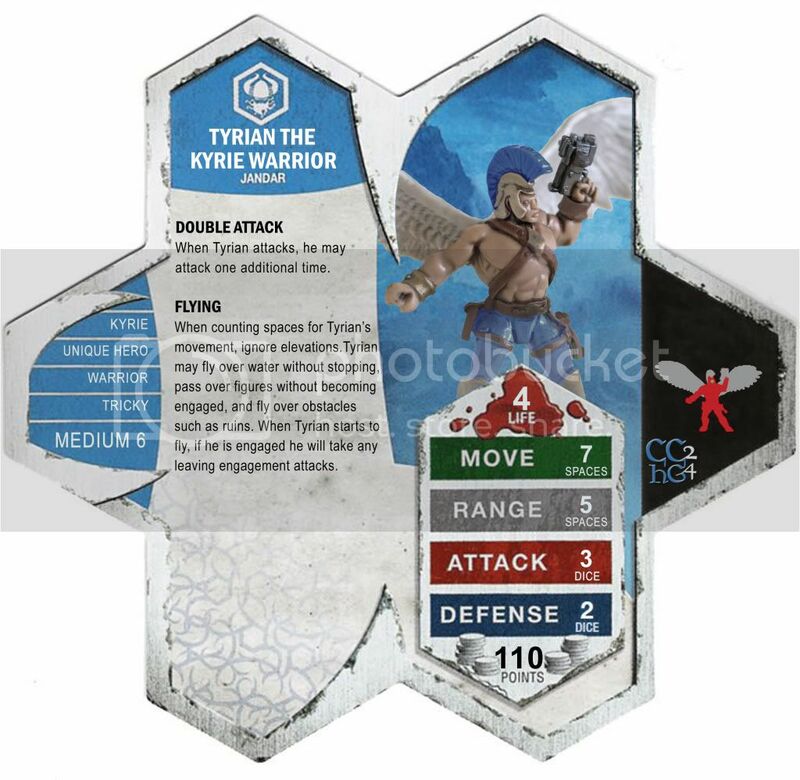 Regretably this is a fairly narrow role, and I didn't feel like Tyrian brought much new to the table, therefore I vote NO to induct Tyrian the Kyrie Warrior. First, I want to thank Tiranx for the nomination. Also, Dad_scaper for all of the feed back he has given me for all of my customs. As killometer mentioned OM management is key with him. And just him and cutters alone is not competitive enough to win most games. You need something to give range and deal with special attacks. I'm intrigued by this unit and vote YES to review it. Horned Skull Champion by qt.bangerang has received 4 YES to review votes (1Mmirg, Dad_Scaper, Killometer, ZBeeblebrox) and moves on in the process. Last edited by Killometer; May 23rd, 2011 at 09:00 PM. Yeah, I guess that how each project functions shouldn't have any influence on how they are packaged here. Really it's where each project gets their customs that seperates them, imo. To me it just makes the most sense to keep the SoV units with the threads they originated in. I'm not sure if I should quote this or not, but as an occasional browser of the SOV I just had a really hard time finding the discussion thread. First I looked in the "C3V and SOV" subforum. I found the display thread, but no SOV discussion!!! So then I clicked around some and... well obviously I found it. Would it be possible to have this thread both in the subforum and its original place? Or perhaps you just should take SOV out of the subforum completely? The current organization is just confusing.